Mange is a highly-contagious, extremely itchy skin issue that can affect both dogs and people. 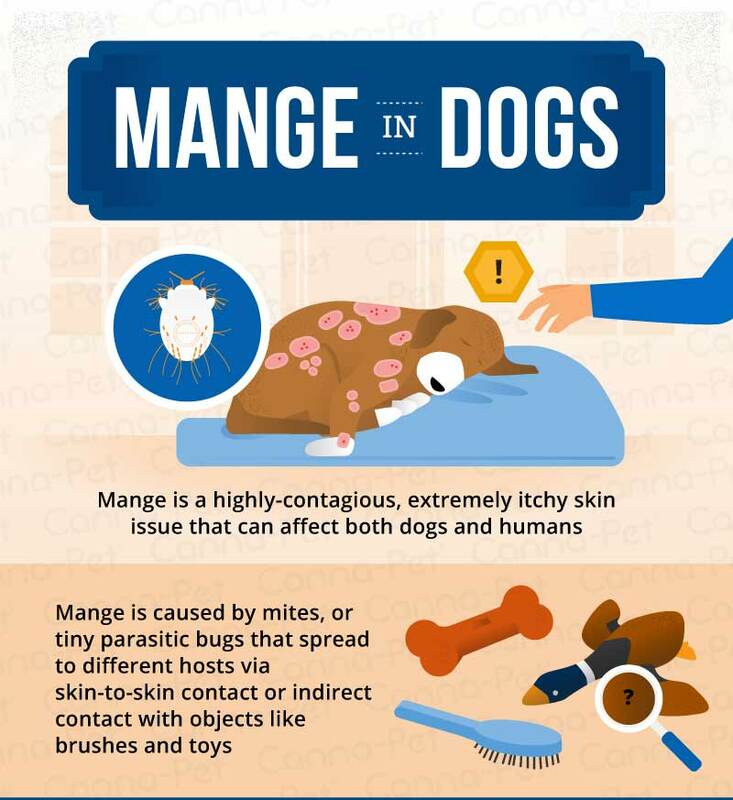 Mange is caused by mites – tiny parasitic bugs that spread to different hosts via skin-to-skin contact or indirect contact with objects like brushes and toys. Several types of mites can cause mange, but the symptoms are similar. Infestations result in relentless itching, fur loss, dry skin, dandruff, red rash, lesions and skin irritation. If you think your dog has mange, it is important to act quickly. Untreated mange can spread very quickly on a dog’s body and become more resistant to treatment over time. Severe mange can also cause permanent scarring or skin thickening. Over time, persistent itching will damage hair follicles and prevent the fur from ever growing back. Another reason to get treatment as soon as possible is because the mites that cause mange in dogs can also attack people or other animals in your house. When mange gets out of control, it will require bathing your dog weekly for a few months in insecticidal dips, treating the other animals in your house at the same time, decontaminating your furniture and bedding to prevent re-infestation when the eggs hatch, and treating yourself and your family. Needless to say, it’s important to catch mange early. There are several species of mites that can cause mange in dogs. The worst is Sarcoptes scabiei, which causes sarcoptic mange, an intensely itchy skin condition in dogs also known as “canine scabies.” Scabies mites burrow into the skin and trigger an allergic skin reaction in dogs. In people, this type of mite can only survive for 5 days, but the itchy skin rash can last for several weeks. The most common type of mite that causes mange in dogs is Demodex canis. This type of mange is sometimes just called “demodex” or “red mange.” Surprisingly, these mites are found on nearly all adult dogs – and people – but they rarely cause mange, except in puppies or dogs with weak immune systems. Demodectic mites live in hair follicles and feed on oils produced by the skin. They are less itchy than scabies mites, but they can also spread to people and cause a skin rash. The third type of mite that causes mange is Cheyletiella. It is sometimes called “walking dandruff” because it is off-white in color and causes flakes of dandruff where the mites are pushing up dead skin. Cheyletiella lives on the skin surface, or close to it. This type of mange is becoming less common now that straw bedding is no longer used in dog beds. Cheyletiella is also less itchy and uncomfortable then demodex or scabies. Like the other types of mange-causing mites, Cheyletiella can spread to humans – although the symptoms are usually milder. The types of mites that cause mange are primarily transmitted through direct physical contact between dogs. This is mostly a problem for stray dogs that frequently contact other dogs, mother dogs with a litter of pups, or dogs that interact with wild animals that carry mites (cougars, coyotes, foxes, rabbits, etc.). Dogs can also get mange without physical contact with another dog. This is sometimes a problem at animal shelters, breeding establishments, pet shops, professional groomers, doggy daycares, kennels or boarding facilities. Dogs can pick up mites on dirty bedding, toys, or grooming tools like combs, brushes and scissors. It is unlikely for a dog to get mange from visiting a dog park because mites do not survive very long in the environment – but it is possible. Puppy mange is usually caused by Demodex canis, a mite that infests most adult dogs. These mites are transferred from mother to puppy via cuddling during the first few days of life. This is not a problem for most puppies, but some puppies develop a mild case of mange with a few skin lesions. Puppy mange almost always clears up on its own. Healthy adult dogs normally have some demodectic mites without showing any signs of mange because their immune system keeps the mites under control. Puppies do not have a fully-developed immune system, so they are more vulnerable to localized demodectic mange. However, puppies of certain breeds are genetically more sensitive to mange-causing mites. For example, Old English Sheepdogs and Shar-Pei puppies are vulnerable to a severe form of demodectic mange affecting the feet called “demodectic pododermatitis.” This can become a chronic foot problem in about 20% of dogs, despite the best treatment. 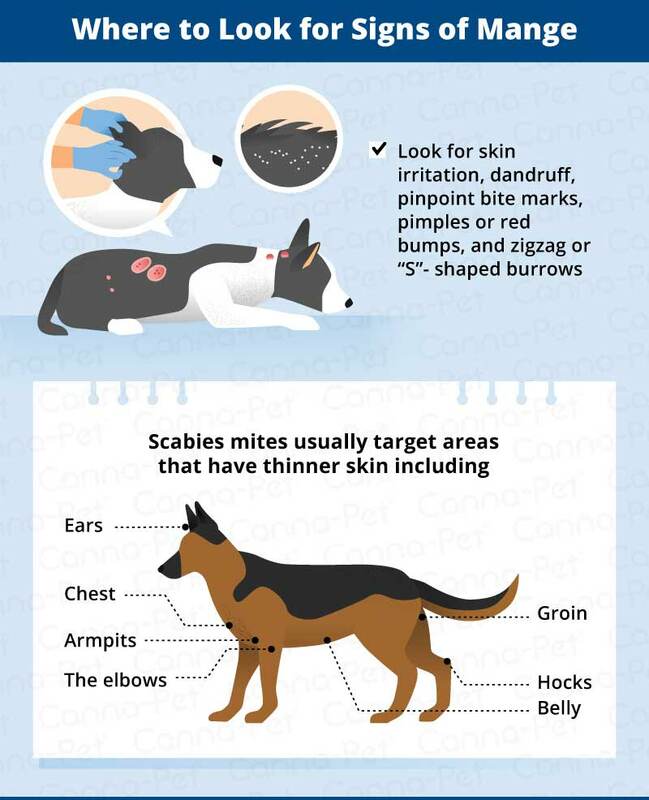 When checking your dog’s skin for signs of mange, you probably will not see an actual mite – but you will find skin irritation, dandruff, pin-point bite marks, and zig-zag or “S”-shaped burrows. In very advanced cases of sarcoptic mange, the dog may be covered in wart-like red bumps called papules because of chronic skin inflammation. Demodectic mites burrow into the base of the hair follicle and feed on oils produced by the skin. A pimple filled with pus (pustule) will form around the hair and cause it to fall out. Dogs with demodectic mange will have bald spots scattered over their body with dandruff and skin that appears red or scaly. Scabies mites burrow more easily into thinner skin, which is why higher concentrations are typically found on body parts with thin skin, such as the elbows, hocks, armpits, ears, chest, belly or the groin. 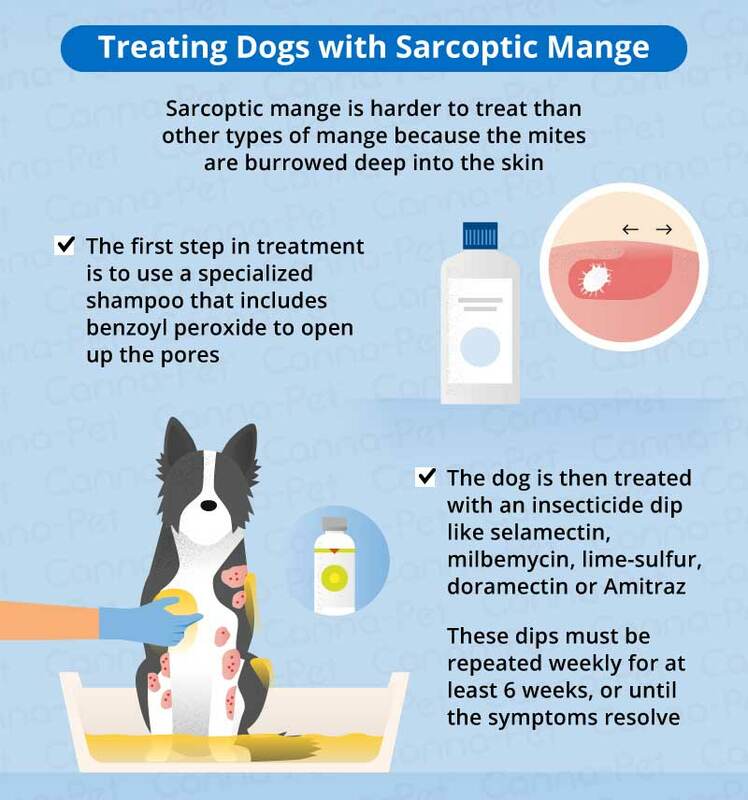 These are the first places to look for the signs of sarcoptic mange in dogs, but it is usually the worst on the dog’s elbows or the tips of his ears. Dogs with mange will itch. Sometimes uncontrollably. No other skin condition in dogs is quite as itchy or uncomfortable as mange. The itching, biting, chewing and licking becomes more relentless and frantic as the mite infestation worsens. It will eventually interfere with normal behaviors including eating and sleeping. Mange also makes it harder for a dog to sleep at night because that is when the mites are most active. Scabies mites are particularly aggressive burrowing into the skin and reproducing at night, which exacerbates skin inflammation and causes more severe itching in dogs. Mangy dogs will eventually lose their fur as a result of constantly scratching and licking themselves. You may notice a red skin rash that spreads all over the body as the mite infestation worsens. Scratches and sores may become infected or produce oozing yellowish crusts. Bad odor is another characteristic sign of mange. The musty, unpleasant smell is not actually from the mites themselves, but rather a complication called seborrhea — an overgrowth of bacteria and yeast feeding on a fatty substance called sebum in irritated skin. Severely mangy dogs will look like they are in very poor health. Over time, mange can progress into a whole-body disease with symptoms like weight loss, fever, enlarged lymph nodes, weakness, vision loss, hearing loss and little interest in anything — even self-defense. Eventually, death can occur as a result of infections, starvation, or exhaustion. Mites that cause mange in dogs can also infest people, though people are not their preferred host. Infestations in people are usually a lot less serious, and will clear up on their own after the dog is cured. Even so, it is always a good idea to wear protective gloves if you are handling a dog that might have mange. If you are infested, you will develop an itchy skin rash for a few weeks, or a scattering of small red bumps and bug bites on your arms, abdomen or chest. This reaction will not clear up until your dog, family members, other pets, furniture, and other places in your home are decontaminated to avoid repeated re-infestations. About 90% of healthy puppies with localized mange will get better within 2 months without any treatment at all. Even so, they may benefit from an antibiotic shampoo to prevent infections from itching. For adult dogs with widespread mange that does not clear up on its own, the type of treatment depends on the type of mite that is causing the problem – so the first step is diagnosis. To identify the type of mite, your veterinarian will scrape off a skin sample or put a piece of sticky tape on the dog’s fur and look at it under a microscope. Fur mites can sometimes be identified in stool samples, since the dog might be ingesting mites during grooming. Dog mange is usually successfully treated with insecticide shampoos or spot-on treatments. Your veterinarian may prescribe an oral medication called Amitraz (triazapentadiene) or a lime-sulfur treatment. Unfortunately, Amitraz treatments are toxic to dogs — as well as cats and people — so you will need to carefully follow your veterinarian’s guidance. For example, Amitraz is too toxic to be used on Chihuahuas, pregnant or nursing dogs, or puppies under 4 months of age. Lime-sulfur treatment is one of the most effective treatments against mange. It is administered as a rinse or dip for 5-7 days, with repeated treatments for several weeks – or until a veterinarian stops finding mites in skin scrapings, which can sometimes take months. Demodectic mange requires 6-14 dips given at 2 week intervals. After the first three or four dips, a veterinarian should do a skin scraping to determine if the mites were actually eliminated. Even if no mites are found, dips should continue for another 4 weeks to kill off any eggs that may have hatched. Dogs should not be considered “cured” for up to 1 year after treatment begins. Sarcoptic mange is harder to treat than other types of mange because the mites are burrowed deep into the skin. The first step in treatment is a specialized shampoo that includes benzoyl peroxide to open up the pores. The dog is then treated with an insecticide dip like selamectin, milbemycin, lime-sulfur, doramectin or Amitraz. These dips must be repeated weekly for at least 6 weeks, or until the symptoms resolve. The standard treatment for dogs with “walking dandruff” is weekly bathing to remove dry scales of skin, followed by weekly treatments with insecticidal rinses for at least 6-8 weeks. The most common dips are lime-sulfur (LymDip) and pyrethrin shampoos. 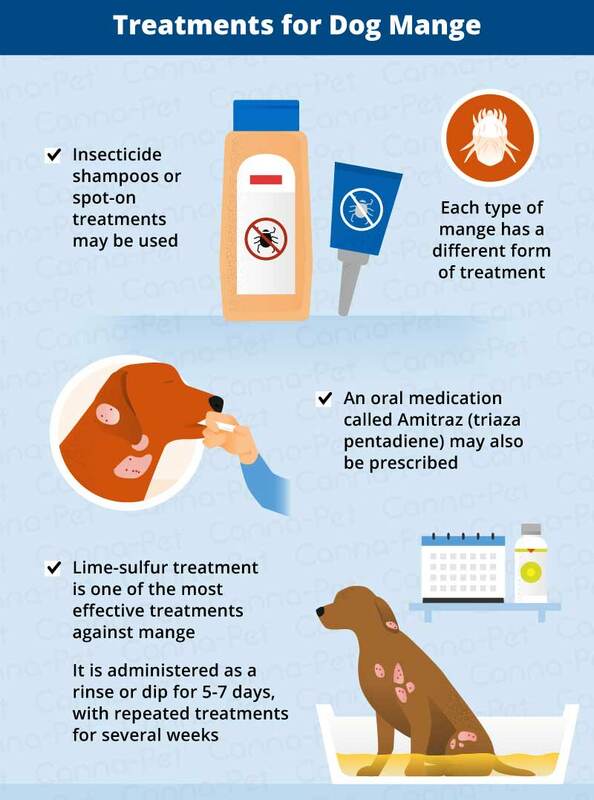 Depending on the dog, your veterinarian may recommend other insecticidal treatments, such as Amitraz (Mitaban), Ivermectin, or selamectin (Revolution). Ivermectin is one of the most effective mange treatments, but it can cause severe side effects or death in herding dogs or mixed-breed dogs with the MDR1 gene mutation. This gene causes Ivermectin and certain other medications to build up in the brain, resulting in neurological complications like tremors, disorientation or blindness. The affected dog breeds include Old English Sheepdogs, Australian Shepherds, German Shepherds, Collies, and Shetland Sheepdogs. Your veterinarian may recommend a gene test before treatment to determine if your dog will have a negative reaction. When one of your dogs has mange, all the other dogs and animals in your household may also need to be treated. The type of treatment for your other pets will depend on the type of mite that is causing mange in your dog. For example, demodectic mites can infest cats and rabbits as well as dogs. 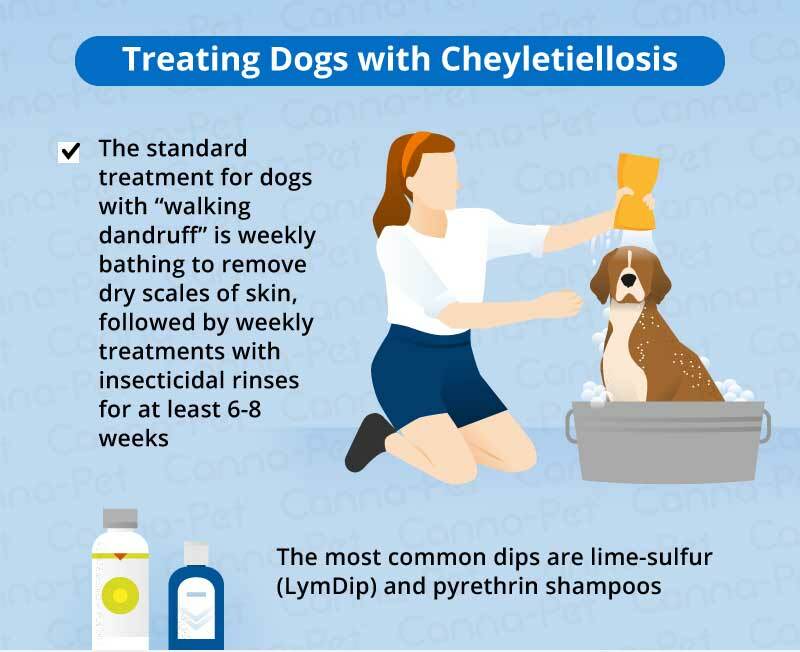 The good news is that most mites will die in 2-3 days if they fall off a host animal, but Cheyletiella can survive for up to 10 days away from a dog. Therefore, it is essential to keep a dog with mange quarantined to avoid spreading infestations throughout your household. Even if you kill all the adult mites, you must prevent re-infestations when the eggs hatch a few days later. This involves thoroughly cleaning all bedding, carriers, rugs, toys, brushes, carpets, and furniture. Fortunately, the prognosis is excellent if the dog and the environment are successfully treated with the recommended products for the full period of time. Otherwise, mange infestations will reoccur. “Diagnosing Mange in Dogs | Demodectic Mange Types and Symptoms.” Healthy Pets, Accessed 17 Aug 2017. www.healthypets.mercola.com/sites/healthypets/archive/2012/10/15/mange-in-dogs.aspx. Carey, Gina. “The Two Types of Mange in Dogs.” PetCareRx, Accessed 17 Aug 2017. www.petcarerx.com/article/the-two-types-of-mange-in-dogs/1610. Coates, Jennifer. “Sarcoptic vs. Demodectic Mange in Dogs.” PetMD, Accessed 17 Aug 2017. www.petmd.com/blogs/fullyvetted/2012/feb/sarcoptic_vs_demodectic_mange-12823. “What Are The 4 Types Of Mange That Effect Dogs?” The Dog Guide, Accessed 17 Aug 2017. www.dogguide.net/mange.php. “Mange and Mites.” The Kennel Club, Accessed 17 Aug 2017. www.thekennelclub.org.uk/health/for-owners/mange-and-mites/.